Another wonderful wedding photograph taken inside The Inn at New Hyde Park in Nassau County, Long Island. Conveniently located just west of Manhattan and Queens Counties, NYC this recently renovated catering establishment is one of the finest offered in the Greater New York area. Stunning, elegant, interior design is the perfect background for your mansion-styled wedding. The ballrooms are fantastic and offer the perfect place for you, your friends and family to party all night long. Outside there are meticulously manicured gardens, including a small bridge, which provides the perfect backdrop for wedding pictures of the bride and groom, their bridesmaids and ushers and all the other members of your bridal party (Flower girls, Jr. Bridesmaids, Jr. Ushers, Ring Bearers, as well as any family members you will include in your wedding photographs). 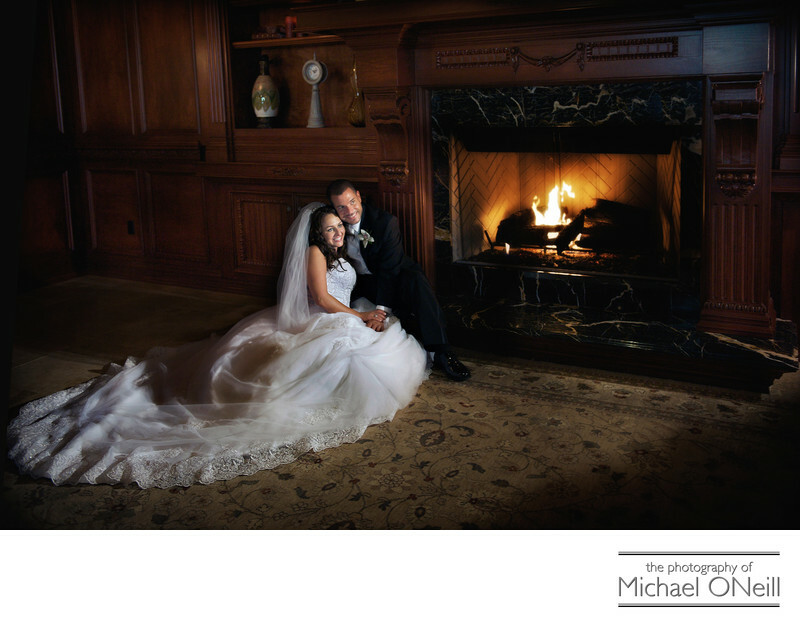 This photo, taken next to the first floor fireplace was one of the couple’s favorite pictures. Elsewhere on this web site you will find more pictures taken at this venue as my years of experience as a professional Long Island, New York wedding photographer has given me many opportunities to create wonderful photography at this establishment. If you are planning a wedding at The Inn at New Hyde Park, give me a call. I welcome the opportunity to discuss all your plans for the big day.